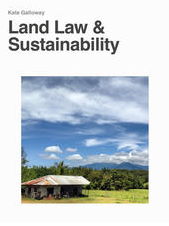 A couple of weeks ago I self-published a free interactive i-book, Land Law & Sustainability. The book is available through itunes – though it can only be viewed by those with Apple devices, I’m sad to say. I received a small grant from James Cook University’s Division of Learning Teaching & Student Engagement for the project. I had already been looking into the possibility of publishing an e-book. I was looking for something to support student learning in law that was inexpensive (possibly free), accessible, able to be digitally manipulated by the user, and aligned with my own teaching interests. I therefore couldn’t resist playing with the technology to do this project. So did I achieve these goals?